Are the New Pod Taxis Coming soon to Indian Cities? India, as a country with growing population, is always in need of more power and infrastructure. Whatever new capacity is added is seen to be exhausted too soon. The people are always on the lookout for more convenience and comfort, especially when they are commuting. The Indian cities lack proper means of public transport for the rising professional lot. This has led to people using taxis from Ola and Uber given their cheap costs. This again has resulted in more pollution for the Indian cities like Gurugram and Bengaluru. It is time for the government to design comfortable, convenient, clean as well as a reasonable public transportation system in India, as the population of working class people is increasing. For example, the millennium city of Gurugram has recently seen many under-passes opening which has definitely eased the lives of many office goers. 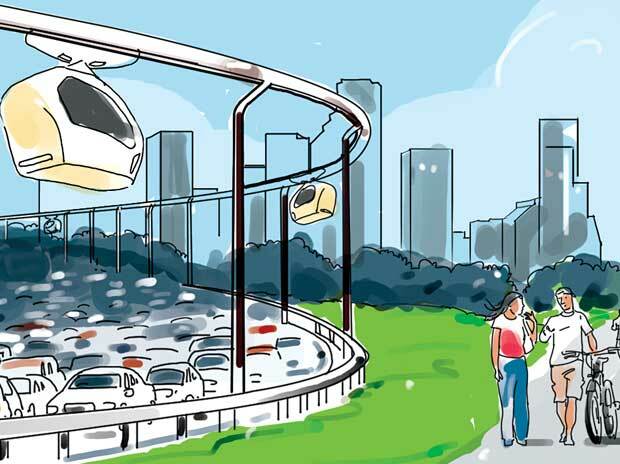 The concept of pod taxis or Personal Rapid Transit (PRT) was proposed for such cities several years back. The project was earlier delayed due to safety concerns and a pilot run on 1 km is now recommended. Very soon a pilot run is expected on the Delhi-Gurgaon expressway. Read more Can Solar Energy power Pod Taxis in India? Fresh bids will be issued for the project, which is expected to cost around Rs 4,000 crore, taking into account the recommended safety measures. The PRT will provide taxi-like services and will be launched in the highly congested areas. However, each pod taxi is designed to carry about 3-6 passengers per vehicle. Then how will it serve the purpose of carrying hundreds of people in highly congested areas like Dhaula Kuan or Rajeev Chowk and that too in the rush hours? A better way for the government to ease traffic concerns would be to expand the Delhi metro line, which helps more than 27 lakh passengers commute in a day. Pod taxis should be utilized to connect residential areas in the cities to other high traffic areas like shopping malls, metro stations etc. For example, it is difficult for people to walk from their homes to metro/ bus stations given the extreme temperatures in Delhi, even though the distance is walkable. Pod taxis will really come in handy in these sticky situations. Though the idea is great and will also go to a great extent in curbing pollution in the Indian cities, it needs to be implemented thoughtfully, taking into account the condition of our transportation infrastructure and needs of the people. These taxis are already running successfully at London’s Heathrow airport, Morgantown and Masdar city in Abu Dhabi.